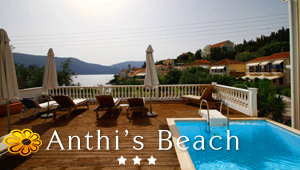 Ai Helis Kefalonia: Ai Helis is located in the southwest part of Kefalonia, 12 km from its capital Argostoli and close to the village of Svoronata. The beach consists of nice sand, crystalline and shallow waters which makes an ideal environment for children. It is surrounded on both sides by towering rocks and enchanting lush greenery that create a beautiful atmosphere. It has a descent development with sunbeds and a snack bar while it is also considered quite suitable for water sports activities. The beach offers two volley courts and is much preferred by the beach volley fans. There is a nice car park. From there it's a ten minute walk to the beach.